Mama Orphans Children’s Home is an orphanage in Busia, Kenya, for children and youth whose parents have died, or who have been abandoned. What is Mama Orphans Children’s Home? 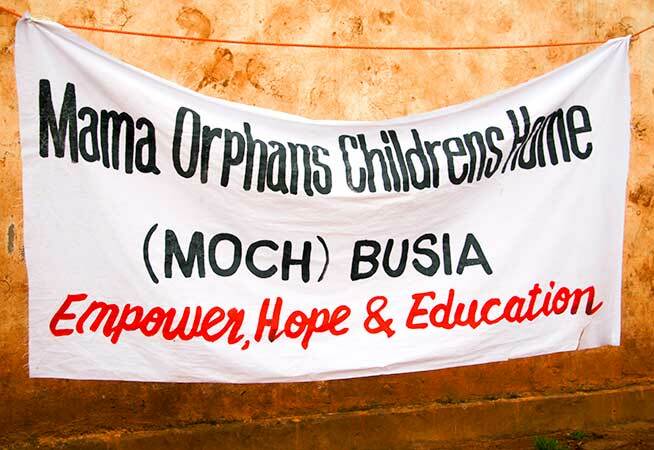 Mama Orphans Children’s Home (MOCH) is an orphanage in Busia, Kenya, founded and operated by Rev. Monicah Oduor. In Kenya, a woman with children is known by the combination of the title “Mama” with the name of her eldest child. So “Mama Orphans” (or simply “Mama”), is the name by which Monicah is best known. Mama opens her home and cares for children and youth whose parents have died, or who have been abandoned, and whose extended families are unable to care for them. Years ago, a Richmond school teacher, Colleen McCormick, accompanied her husband, Dr. David Moore, to east Africa and met Monicah Oduor (Mama). She learned that Mama had created an orphanage because she had felt a strong call from God to take in the abandoned children she was seeing on the streets. Colleen also learned that Mama was operating this orphanage without any external financial support. When she returned to the Lower Mainland, Colleen spread the word to her family and friends, inviting them to support Monicah’s work and send funds. One of Colleen’s friends was a member of our congregation and that is how Crossroads came to know about Mama. Monicah Oduor is a long time resident of Busia, Kenya who is married and has nine biological children. She has been a shop-owner and preacher in Busia for many years. In 1996, Mama heard a call from God and took in six young boys who had been living alone on the streets of Busia. This was the beginning of what came to be known as Mama Orphans Children’s Home. Originally, Mama housed the children in her own home, but over the past 20 years, as more and more children have come, the orphanage has expanded to a compound with a dormitory block, dining hall, classrooms, volunteer housing, and open areas for play. Mama does not turn children away. She now houses and cares for more than 150 children ranging from 0-18+ years old. Some of the children have been orphaned by AIDS and motor vehicle accidents, some have been abandoned by their parents, and others have run away from abusive and neglectful families. Mama receives no funding from any level of government and has dedicated her life, time, and resources to operating the orphanage and caring for the children. Over time, the orphanage has fostered international connections with concerned partners who have provided financial support, such as Crossroads. On International Women’s Day in March 2015, Mama was recognized by Busia County with an award for her outstanding role in the community. Primary school in Kenya is universal, however the children must have school uniforms, proper shoes, textbooks, and school supplies, which all cost money and can be prohibitive. The costs for schooling for all of the children at the orphanage are an ongoing problem for Mama. To address this, Mama developed a primary school on site at the orphanage, called the David Moore Academy. She hires local teachers and has frequent volunteer teachers from England. Mama’s goal is to provide quality primary education and eliminate the prohibitive costs. In Kenya, high school is not free; there are costly tuition fees that cause high school education to be unattainable for many students, especially those at the orphanage. Fortunately, there is now an initiative to engage international sponsors to pay for the high school education of the MOCH youth. This has enabled many students to complete their four years of secondary school and graduate. This is a major achievement for these students who would otherwise have stopped their schooling after the primary grades. The students are well aware that education is their key to a promising future and are incredibly excited and appreciative of the opportunity to pursue their education. In 2013, Mama, her son Bobby, and daughter Betty, came to visit Crossroads and their other Vancouver-based friends and supporters. Crossroads folks hold Mama and the orphans even more closely in their hearts now and invite others to support her ministry with their financial resources and their prayers. When she was here, Mama invited the whole Crossroads congregation to charter a plane and come to Busia to witness what God is doing with the orphans! Donations get to MOCH through the Kenyan Orphan Children Foundation, a Vancouver-based charity founded by Colleen McCormick and others. Visit Kenyan Orphan Children Foundation website for more information. The Foundation has no administrative fees and all donations go directly to Mama and the children. There is a fee to wire the funds through the bank, however the Foundation works to make this fee as small as possible by sending lump sums several times throughout the year. Make cheques payable to Kenyan Orphan Children Foundation. You, alone or with a group, can sponsor a student for their four years of high school education for approximately $1100/year/student. For more information about this opportunity, please email Leslie Myers at leslieemyers@gmail.com. Bring your empty bottles to Crossroads where they will be returned for a refund and all proceeds will be donated directly to MOCH. Go ahead and do what you can! All funds raised go directly to MOCH. Mama and her family are very welcoming of volunteers. With so many children to care for, extra hands are always needed. There are several people in the Crossroads congregation who have visited the orphanage and would be happy to talk about their experiences and answer questions. Read Mama Orphans Children’s Home updates in the Kenyan Orphan Children Foundation’s December, 2018 Newsletter. For more photos and updates, please visit Mama Orphans Children’s Home on Facebook. 8:30 am – 2:30 p.m.